And the parody of it probably isn’t funny, either. Signs are odd. People are often unlikely to do what they suggest – unless they were going to do it anyway – and in the case of safety signs, the person who’s careless enough to do the thing that the sign is warning them about is pretty unlikely to read the sign. And then there are the safety inserts on airliners, which do little more than terrorize those who are already afraid of flying. So we’ve decided we need a guerrilla sign campaign. There are lots of collections of amusing signs out there (and Japanese wii Manuals too), but it always seems that as soon as someone slaps the label “funny” on something, it isn’t. So help us out by using one of these tools to create something actually funny. 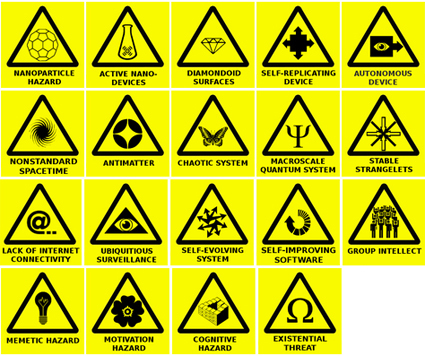 First, we have a collection of “hazard” signs right here on Dissociated Press. Use the text box below the image to suggest a caption. You could also try this Warning Sign Generator or this Street Sign Generator . This tool at St Clair Signs offers a lot of choices, but you need to create a log-in. The thing is, it’s so easy to create these signs with even the most basic software, that there’s almost no reason to go looking for them. If you don’t agree, maybe you need a copy of Warning Signs For Idiots . And since notices and signs are so ineffective, we’ll repeat that we’d love it if you’d submit a caption for one of our hazard symbols. Product warning labels are for the weak… I say save humanity, bring back natural selection!